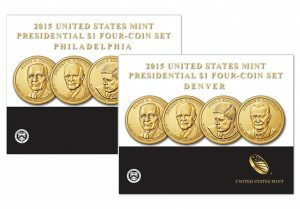 Earlier today, Feb. 3, the United States Mint released the first of three 2016-dated Presidential dollars. 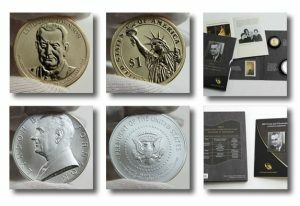 This newest coin memorializes Richard M. Nixon who served as the 37th President of the United States from 1969 to 1974. Product options available include rolls, bags and boxes of the dollars in circulating quality. 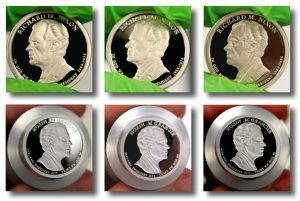 As we approach the new year, we’re treated with images and details of upcoming coins. 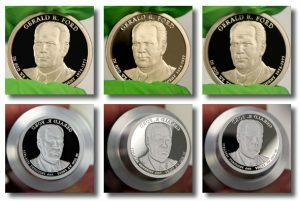 Among those to debut in 2016 is the Gerald R. Ford Presidential $1 Coin. 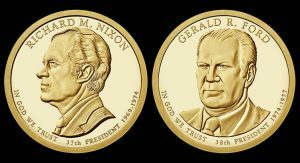 Richard M. Nixon, the 37th President of the United States, will be honored in 2016 on a new coin from the United States Mint. Final designs for two of the last three Presidential $1 Coins became public Friday when the United States Mint unveiled images of them. 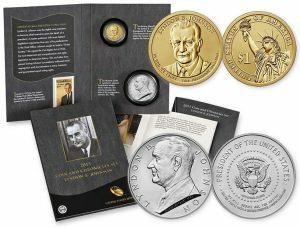 This short article presents a photo overview of the Lyndon B. Johnson Coin & Chronicles Set with its reverse proof Presidential $1 Coin, silver medal and 8-cent U.S. postage stamp. 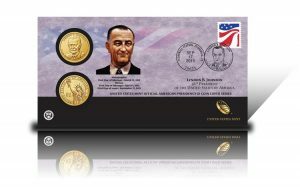 At noon EDT today, Sept. 17, the United States Mint began taking orders for a new coin cover that includes two circulating quality Lyndon B. Johnson Presidential dollars. 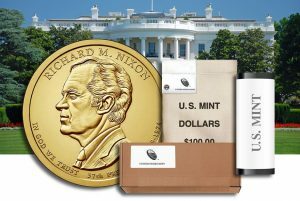 At noon ET today, Sept. 3, the U.S. Mint released the last 2015-dated Presidential $1 Coin & First Spouse Medal Set. 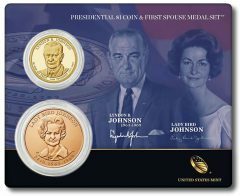 This newest collectible commemorates Lyndon B. Johnson, the 36th President of the United States, and his wife Claudia Taylor "Lady Bird" Johnson.